There is even that curved line on the neck that reminds me of a collar. 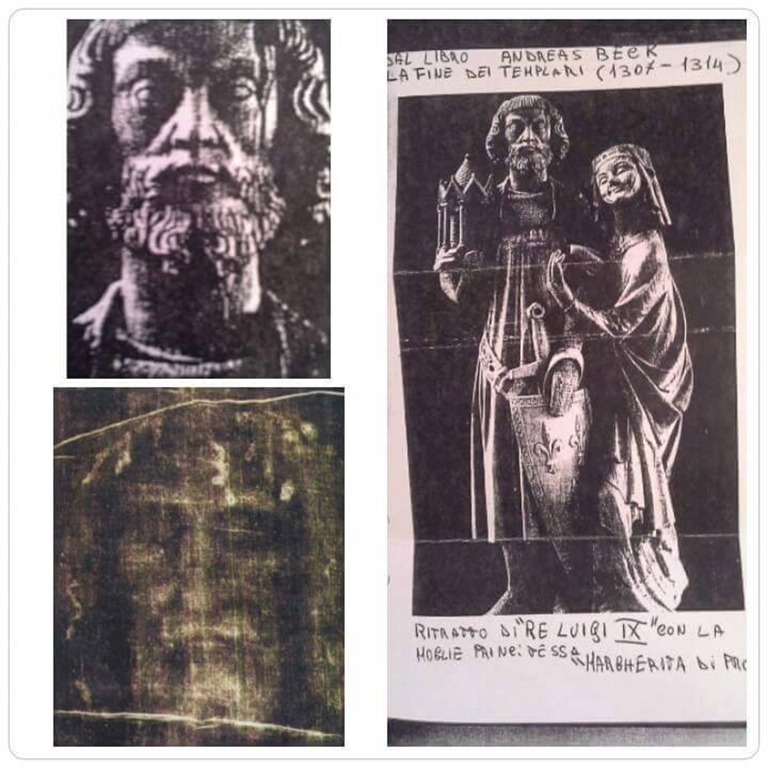 Supposedly the Shroud of Turin (many people believe it’s the shroud in which Jesus of Nazareth was buried) defies carbon testing, DNA testing, has a strange indecipherable pattern — what could the real-world meaning be behind this holy object? 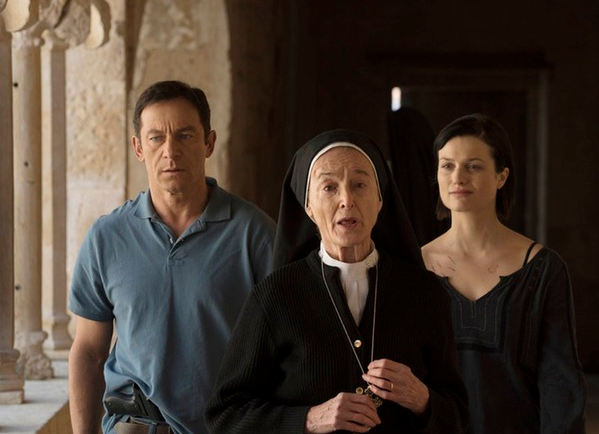 Even if it dissolves into Da Vinci Code “Jesus’ descendants” nonsense, it will surely be fun. Now, doesn’t that sound like a television critic. This is portrait of King Louis IX with his young wife. For me and my mother appears OBVIOUS that the man of the shroud and Religion IX (who died at the age of 56 years) are the SAME PERSON. This portrait of King Louis IX as a young man, has "escaped" to Phil Kingippo beauty, which destroyed all authentic portraits of King Louis IX and made it to the other false, because it was he – because of money -a pass the shroud done with the body of King Louis, to that of Jesus’ . In fact he did kill the Templars because they wanted at all costs to say the truth, and that was the reason that even the Pope Celestine V is bare ‘papal event not to give in to his blackmail; As for the sheet, it may have been made with a type of seaweed that has the characteristic similar to a carbon copy. 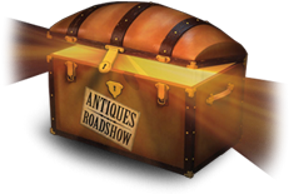 THE VATICAN – The hosts of long-running TV series Antiques Roadshow from the United States, UK, and Canada teamed up at the request of Pope Francis and have determined that the Shroud of Turin was without a doubt Jesus Christ’s funereal blanket. American reality TV show Pawn Stars was also asked by the Vatican to examine the Shroud but declined, saying their participation could put the legitimacy of the research in doubt. goes to Colin Berry for a comment to You cannot fold and unfold a painting (and more). Guess who has been poked. Would someone care to make me an offer for the GENUINE Mona Lisa? Yes, this is the real one, not that cheap and garish imitation that hangs in the Louvre. There are three ways you can tell that mine is the original. Firstly, all, and I mean ALL the original paint pigment has fallen off, leaving just a ghost of Da Vinci’s original. Second, you will note that what remains is a tone-reversed negative. Yes, when pigment detaches from a Da Vinci, one is left with a negative of the original. Not many people know that. 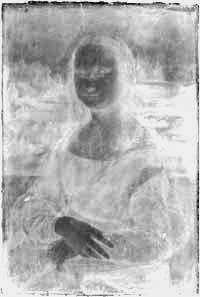 Only a genius of the highest order – Leonardo Da Vinci – centuries, nay millennia ahead of his time – was able to paint an image that degrades to leave a photographic negative with encoded 3D properties. Message to prospective purchasers: informal ostentations are held nightly at my home, 3, Railway Cuttings, East Cheam. Entrance is free, but viewers are expected to purchase the East Cheam Pilgrim’s Badge, cast in durable epoxy resin for a special reduced price (£35 plus VAT). 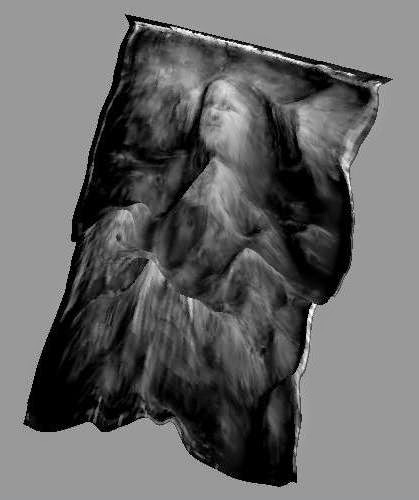 … I am not stating you haven’t spent an enormous amount of time and energy attempting to recreate a likeness that would disprove the Shroud image. That is commendable, although antithetical to Christian belief. Yet, it is your right, as a scrutinizing scientist…. Angel: there’s nothing “antithetical to Christian belief” in being a sceptic where the TS is concerned. Ask the Vatican if you don’t believe me. Cesare Emiliani, Department of Geological Sciences, University of Miami, world renowned geologist, known for his work on marine sediments and plate tectonics, in a letter to Nature following the carbon dating of the Shroud in 1988. Religion is perfect and unchangeable, the work of God. Science is imperfect, and, I suspect, the work of the Devil. The two should never be mixed. The scientists who participated in the dating of the Shroud of Turin should repent and promise to never do anything like that again. Creationists are even more guilty, for they have been mixing science and religion for years and years. They should abandon their evil practices forthwith, lest the wrath of God descend upon them like a ton of bricks. What’s with the wind noise and the big stick? This has to be the most unusual skeptical YouTube I’ve seen on the subject of the shroud’s authenticity. Don’t worry, it is only two minutes long. Did he just say it is easier to fit a round peg in a round hole? 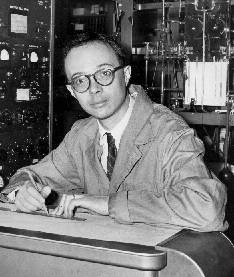 A couple of years ago you wrote a parody of an article about Luigi Garlaschelli. I am preparing a lecture on the Shroud and was thinking of using the fake article as a humorous handout. I have not been able to locate it. Do you have a copy that you can send to me. Actually, it was five years ago. As I read it now I am embarrassed. It was kind of stupid (nah, maybe it was a bit funny). Here is the boring original news story from Reuters. In tracking it down I found this lead up link to it in PZ Myers’s Pharyngula, unquestionable the leading New Atheists blog out there. Here, below the line, is what I wrote (undoubtedly late at night sitting alone in some Jimmy Buffet Margarita Ville bar that I can’t remember. Feel free to use it. And there is no need to give me the credit. You may or may not want to read the shaggy dog posting, The Alien "Shroud of Turin" in the UFO Museum Collections, Portland , Oregon. Even though I am a ufologist this is not an object that I know a lot about. For all I know it may be a fake? But by the looks of it. . . . Accidents like this cannot be fakes. At least they usually are not fakes. The Elvis tortilla probably was a fake . . . etched by some one with a wood burner tool? This piece is nothing like that. 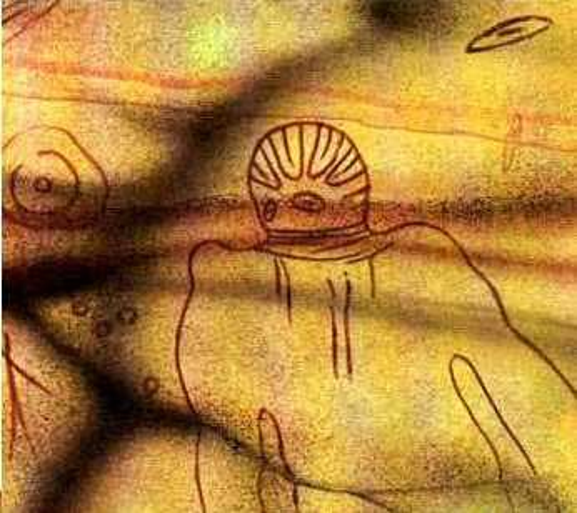 Look carefully: there are aliens, flying saucers and poker holes in an L shape. (Not to worry: I still disagree with Colin Berry et al and think the third drawing in the Hungarian Pray Manuscript is based on the shroud).